Children often take many weeks to warm up to a new activity or new environment, and every child will approach this experience in his or her own style. Please don’t be concerned if your child doesn't join in, or does something different from the rest of the group. The class is the setting where children absorb new ideas, and they often practice these ideas once they get home. The best way to help your child absorb these new musical skills is to participate and have fun in class yourself. You don’t have to be musically skilled! Just participating in class activities at your own comfort level will help your child develop the disposition to be musical - and this is a gift your child will enjoy for a lifetime. You may have fun noticing how your child’s response to music changes over the course of the class, not just in the classroom but at home as well. It doesn't matter what you sound like! We're just having fun with music. The best gift we can give our children is simply the confidence that they too can make music. When we make mistakes, laugh, and go on, we give our children permission and confidence to try it themselves. If you’re a shy singer, experiment with singing out, and don’t worry - nobody will put you on the spot. This is a great environment for building your own musical self-confidence as well as your child’s! Please keep your child at home if there is any chance they could be spreading contagious illness, especially if there is coughing, sneezing, very runny nose, etc. We have a very liberal make-up policy, and you can always make up a class you've missed. It's normal and developmentally appropriate for young children to put things in their mouths. This is an important way young children learn about the world. While we don't want to frustrate children in their developmental drive to explore things through oral exploration, we also want keep our play materials sanitary. We encourage you to allow your child to explore the instruments in any way that's safe. If it goes in a mouth, just put it in our "wet box" after the activity, and we'll wash and sanitize it after class. If your child is prone to oral exploration during the jam session part of class, you can gather some items that are particularly mouth-friendly (i.e., smooth, plastic, and sturdy), and set them with your child away from the general collection of instruments - or else be vigilant about setting things aside so they don’t get into another child’s hands until they’ve been sanitized. You can help support sanitation in class by being aware of oral exploration, even if it’s not your child engaging in it, and taking steps if necessary to prevent mouthed items from going into another child‘s hands. We all share responsibility for our children's health. Waterless hand washing gel, alcohol wipes, and antiseptic spray are always available in the classroom. Feel free to use any of these materials at any time during or after class. Sometimes children need to bring a special toy or “lovey” from home. Please be sensitive to the reactions of other children if your child has brought a toy. Toys that sparkle, make sounds, or have moving parts can be especially distracting for other children. If a toy is distracting, suggest to your child that it “watch” or “listen” from a shelf or special place in the room - or maybe the toy can be “napping” during class time. Use your discretion and creativity. Please keep snack foods stashed during class times. If your child is hungry in class, it’s fine to step outside for a few minutes for a snack break, and then join back in. Some children learn best while while they're in motion, and wandering children are often still actively learning. Running around the circle, however, is a safety issue as well as a distraction to other children. If your child likes to run, feel free to scoop up your child for some additional movement fun even if the rest of the group is engaged with a quiet activity. Your child might like being bounced or swung, and this will help your child get the kinesthetic stimulation they crave. We'll always have some time to run, gallop, trot or jump as a group during our active songs. Young children thrive on ritual, and for many children the Hello Song is their favorite song. This is the song that helps the group settle in to the activity of making Music Together®, and the song that specifically welcomes each child by name. The Hello and Goodbye songs are also the only songs we do every single class throughout the semester, so they become especially important to children. You’re already an expert. 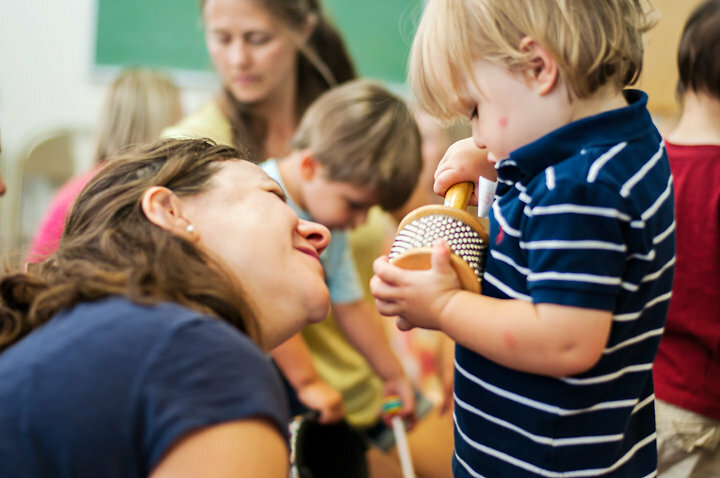 There is no wrong way to do the music or the activities, and we have lots of fun playing with different ideas in class. Don’t worry about doing things “wrong” if your style is different from your teacher’s. When you find the way that works for you, you teach your child how to be creative too. Your child is unique. We’ll offer a variety of activities, often with the same song over a period of weeks. Your child will modify these ideas to fit his or her needs - which may mean sitting while everyone else is standing, or jumping while everyone else is sitting. Often a child who appears to show no interest in class activities is really quietly absorbing them, and will repeat them perfectly once back home. Feel free to encourage your child to participate, but let your child have the choice about how to do it. Children learn best when their learning experiences are joyful. When you’re having fun, your joy is contagious. This is your own weekly chance to let go and liberate your own sense of play. Let yourself get loose and silly! Your child will love this chance to play with you on his or her own level. Enjoy the music at home. This class is only a jumping off point. The songbook is full of suggestions for enjoying the music with your child at home, and you may think of many other ways. Even if you don’t read music, you might look at the pictures together, or follow along with the CD. Feel free to change the words to suit bath times, bedtimes, etc. It’s your music - you can change it any way you want.